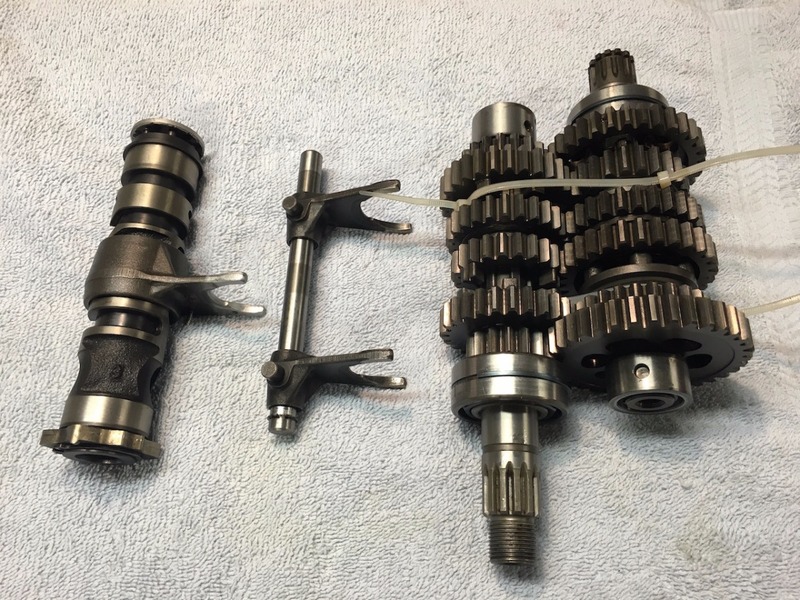 This is a summary of the 6-speed transmission swap I did on my 81 kz750e. Because I could not find any instructions to do this modification, I researched the subject for months. These are the final results of my efforts and are not the definitive instructions, but simply the way I went about it. To preface this, my entire goal of this transmission swap was to be able to keep the stock gearing on 1st through 5th gear, and yet add a usable overdrive to keep revs down while on the interstate. So when I was researching this swap I got on gearingcommander.com and started running all the numbers to see if what kind of RPM’s and speed benefits could be made by using the 550 6-speed transmission. This is what I used for my particular build. 2. 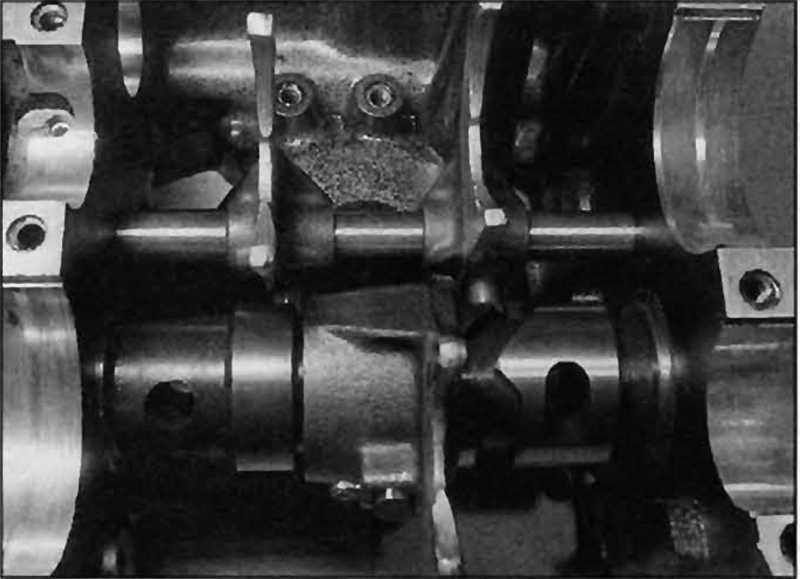 Shift drum and selector forks and rod from the corresponding 6-speed transmission. 4. 550 front sprocket with mounting holes tapped in it. Your particular wheel and tire size and chain pitch will dictate how many teeth and what offset the sprocket will need. 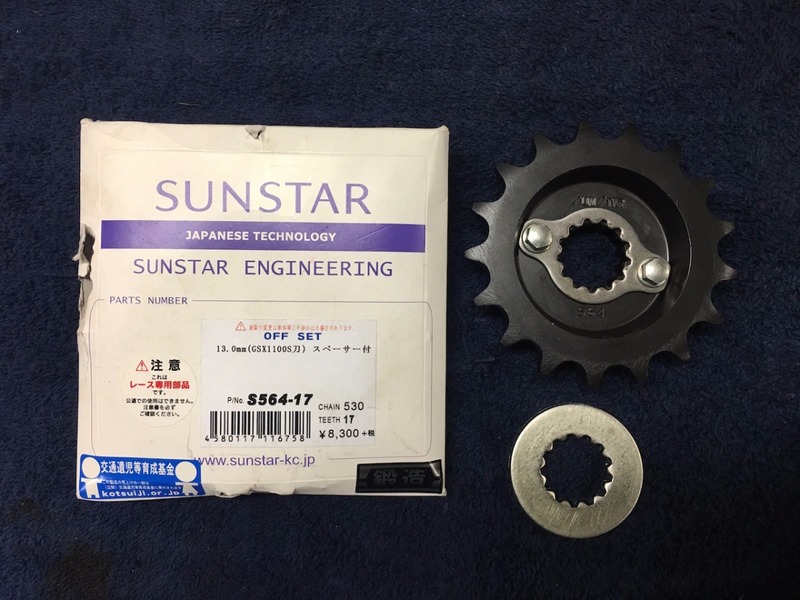 Picture shows a spacer that came with the sprocket but was not needed. The transmission is simply installed in place just like the 750 transmission, only making sure that you have the correct style bearing cap installed for your particular clutch release type. The 550 shift drum installs in exactly the same way as the original, BUT TAKE NOTE OF THE ORIENTATION OF THE SHIFT FORKS! On the 550 models, the longer side of the fork boss faces the RIGHT-hand side of the shift drum. On the 750 models, the longer side of the fork boss faces the left-hand side of the shift drum. THIS IS WRONG! Case halves bolted together for testing. Then spin the input shaft with a cordless drill so you can get past the neutral lock out and made sure that you can select all six gears before going any further. It may be necessary to put a small amount of drag on the output shaft when doing this. Under normal operation, the tire and chain propelling the bike forward provides tension on the output shaft. Without this tension, the transmission shafts rattle and oscillate at different speeds and will not let the dogs engage properly when testing. I lightly put drag on the output shaft with one hand and operated the shift mechanism with the other all while a helper spun the input shaft with a cordless drill. The clutch for the 550 transmissions are much smaller and as a result the input shafts are shorter and there aren’t enough threads to fully bolt on the 750 clutch hub. The 550 clutches will work but they have a totally different primary gear ratio (2.934) than the 750 (2.55) So different that it is would negate any benefits of swapping to a 6-speed. 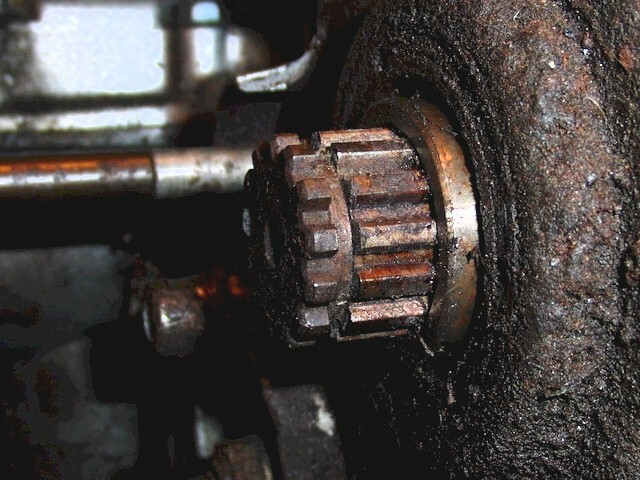 Note that nut is not fully able to thread on shaft. The nut is 3mm short from fully threading onto the input shaft. So I had a machinist remove 3mm from the inside of the hub. There was a belleville (warp) washer originally under the clutch nut to keep it from backing off, but without the washer, the contact patch between the clutch nut and clutch hub barely 1.5mm wide. (The hub has a deeply chamfered area at the splines that greatly reduces the contact area between the hub and nut.) So the warp washer not only provides tension, but creates a larger surface area for the nut to distribute the clamping force. I did not feel comfortable with such a narrow contact patch holding such an important component together that also sees so much abuse. So I had the machinist remove another 2.5mm to make room for a 47x20x2.5mm stainless washer for a total of 5.5mm of material removed from the inside of the hub. that was removed. The wider washer would also help distribute the clamping force over a wider area. 2. The beefy 30mm impact socket I used to remove the nut was 47mm in diameter. So I didn’t want to recess the washer and nut into a narrow hole that I couldn’t get an impact socket into. 3. I could not find a hardened washer with a 20mm ID that had the OD that was even close to what I wanted, so I went with a beefy 2.5mm thickness instead. I then bolted the clutch hub onto the input shaft using blue loctite on the threads. You will first need to decide if you want to use a 520 or 530 pitch chain. I chose the 530 as there is a much greater selection of aftermarket offset sprockets for the 530’s. 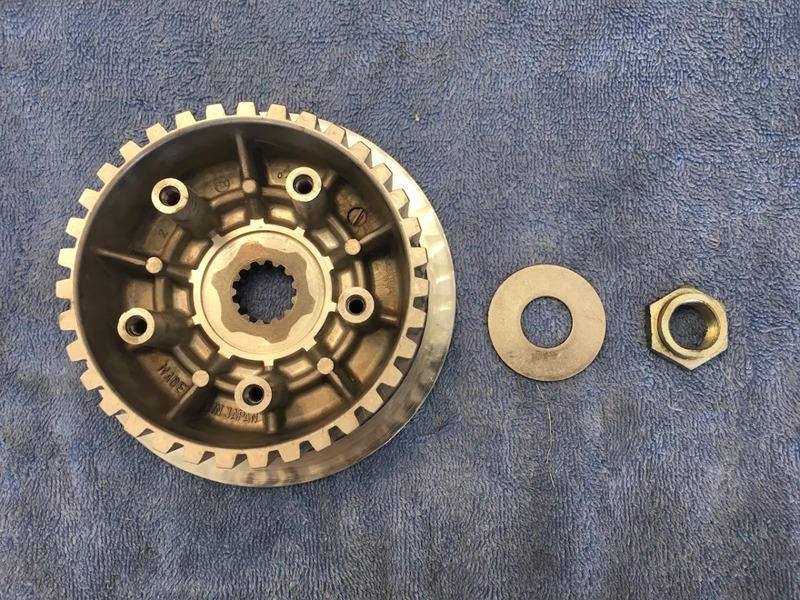 The other issue I encountered, is that the 550 transmission is designed to use a 520 sprocket and the 530 sprocket I used had a wider splined area and it would not fit onto the output shaft fully. There is a collar that is on the shaft that the transmission cover seal rides on, that kept the wider sprocket from seating properly. On the 750 transmissions this collar is held on by the sprocket which is bolted in place and once the sprocket is removed, the collar slides right off. 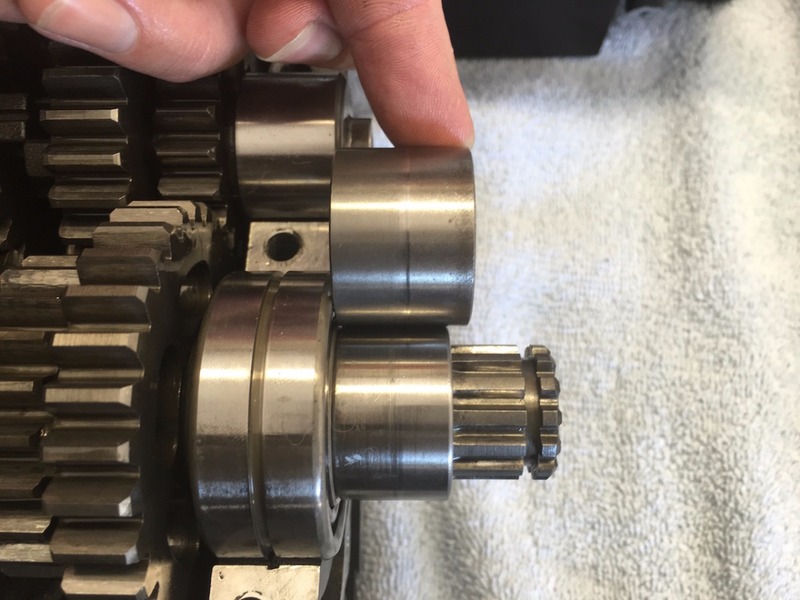 But the 550 collar is pressed in place as the sprocket is held on by a splined collar that allows the sprocket to “float” on the output shaft. The 550 collar is designed to be removed by pulling off the outer bearing. Instead of doing this, I wedged the collar away from the bearing with a jewelers screwdriver just enough that I could fit a bearing puller on the collar and pull it off. I then had to have 3mm of the collar machined off to make room for the new sprocket and give it room to float. Then I pressed it back on and it sits just flush with the outer edge of the transmission cover. 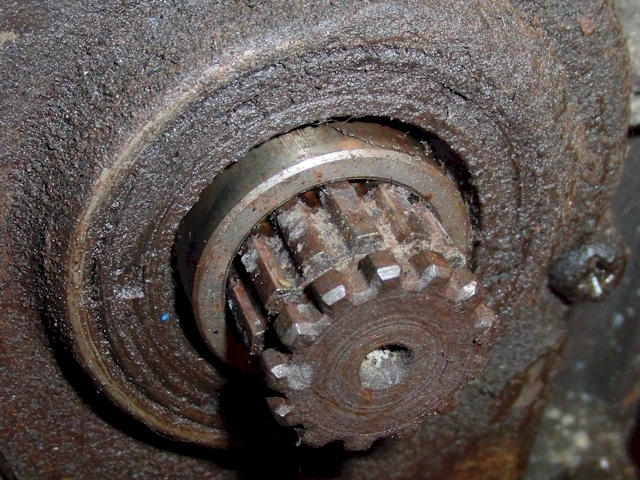 Note gap between sprocket and cover. You will probably need to custom fit your chain depending on the variables of what pitch you chose and what sprocket tooth count you used, combined with any swingarm modifications. I bought a 120 link chain and trimmed off the extra links to fit my specific setup. Having done this swap, I simply cannot imagine how it did not come this way from the factory. I was worried that in sixth gear and at a steady cruise that I would be out of the torque band of the motor and it would bog and have no ability to accelerate. These fears proved to be completely unfounded. And as long as I don’t let the rpm’s dip below ~2750 in sixth, the engines low end torque can easily accelerate the bike as if Kawasaki designed it that way. So I got exactly what I wanted, totally stock gearing and a true over drive gear that did not sacrifice my low speed performance the way that a sprocket only upgrade would have done. Great job. I have always wanted an additional gear on the freeway. That's an amazing write up on a project that has been rumored to work around here for years. I'm not sure anyone ever really had a 100% confirmed-to-work and ride-able example before. I just wanted there to be some sort of information out there to dispel the urban legend of the mythical "6-speed in a kz650/750." When researching this, I read a lot of comments like: "I did this on my bike years ago" or " Its real easy. Just bolts right up." But I never found anybody that would provide any specifics. So since I had to split the engine cases on my 750 anyway, while it was apart I test fit the zx550 transmission I had laying around. And since it fit so easily I took a stab at solving the clutch hub issue and once that was sorted, I was was pretty committed to going all the way. loudhvx - You bring up another detail that I missed. I didn't realize that the early 550's used 530 chains. 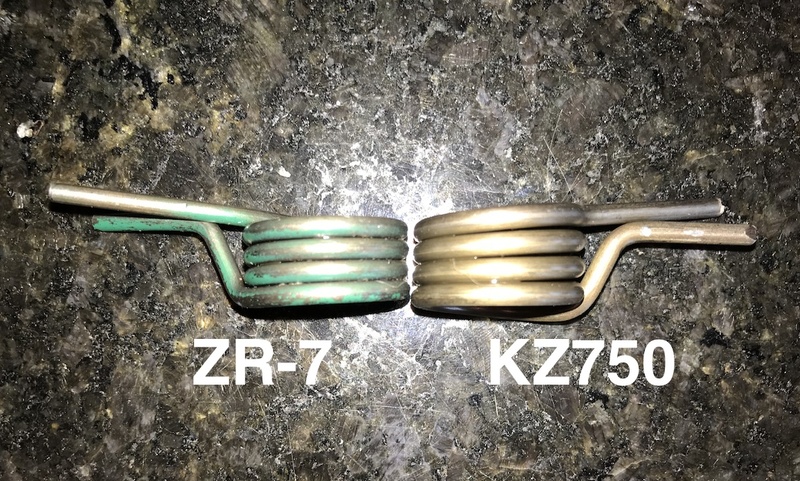 But the output shaft collar (part# 92027-1106 25X32X23.5) is shared by the early kz550's to the zx550's, Zephyr 550 and even the zx600's. So the extra wide offset sprocket I used was to blame for the fitment issue and not it just being a 530 sprocket. These are the kind of important details that need to be pointed out! That corresponds with the roughly ~15mm on the zx550 shaft. I thought about doing this when i swapped a 650 into my 550 (it blew a rod) but eh i didn't feel like splitting the case.... 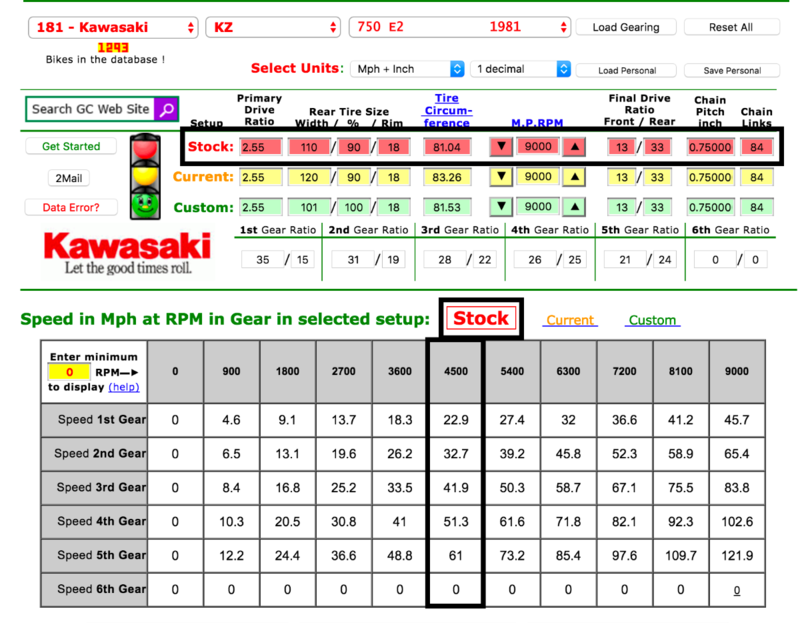 I calculated the ratios and I get 5.8mph more (62.7mph) at 4500rpm in 5th with the 650 over the 550 in 6th so thats nice. I am curious though, can the case be split and the 6 speed installed without removing the crank/pistons/head etc? I can't remember how that part went when i took apart the 550 motor. Great write up, I was planning to do this too sometime. I'm puzzled why they didn't make the 750 six speed, could it be the tourque loading increasing by a 120 percent ( 6 /5) put it outside their 'bulletproof' safety margins? The GPZ600 water cooled shared the same 550 transmiission and had more power but less tourque. Saablord wrote: I thought about doing this when i swapped a 650 into my 550 (it blew a rod) but eh i didn't feel like splitting the case.... 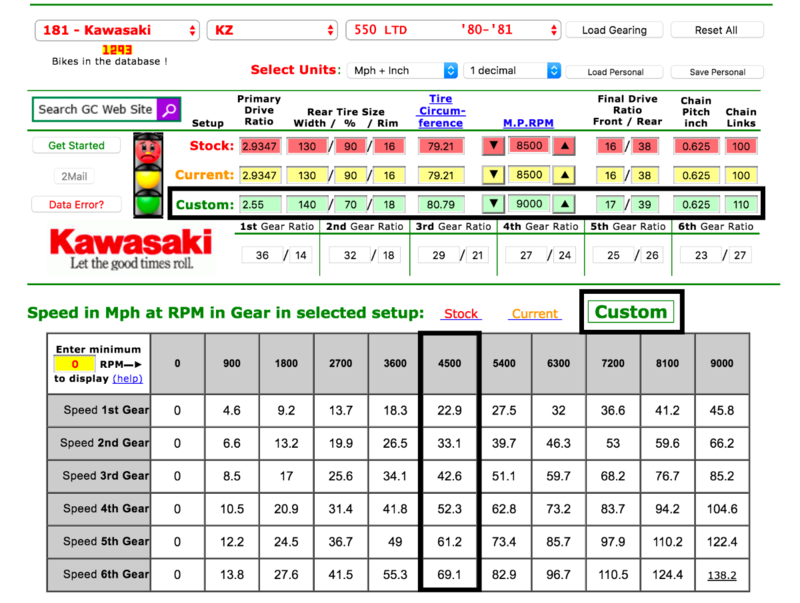 I calculated the ratios and I get 5.8mph more (62.7mph) at 4500rpm in 5th with the 650 over the 550 in 6th so thats nice. The engine cases can be split without removing the cylinder head, pistons or crank. Just turn the entire engine upside down and remove the lower case to access the transmission. BUT...the clutch, oil pump and secondary shaft have to be removed first in order to fully split the cases. A full read through in a service manual will explain that in more detail. Tyrell Corp - I think you are correct about the torque on the transmission being a possible reason that Kawasaki never put a 6 speed in a 750. 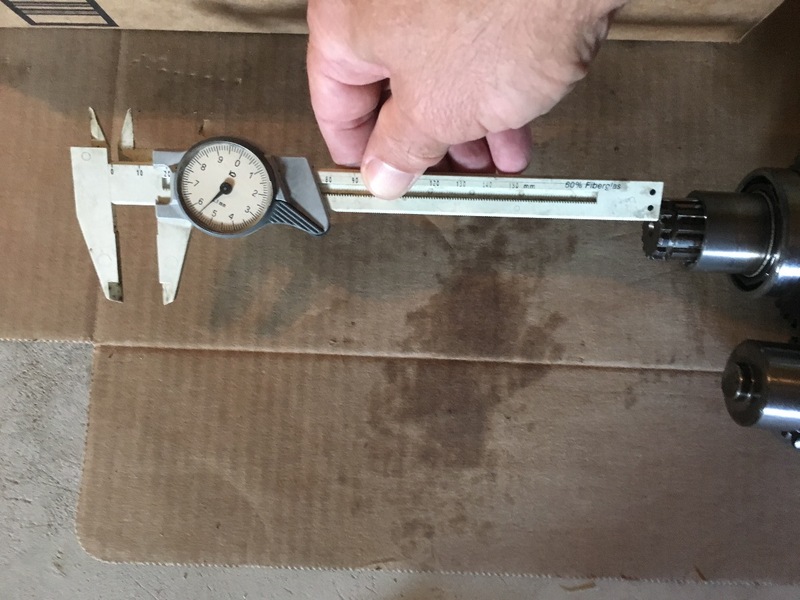 The 5 and 6 speeds share the same bearings, so there had to be a load/shear failure formula of some kind that was used to determine that the reliability of the transmission as a whole might suffer. But I have read of guys putting these into gpz750 race bikes and they never mentioned one exploding. Drag racing with one is probably a bad idea considering material that I removed from the clutch hub, but on the street I have zero concerns that the transmission will grenade itself. Slightly less bulletproof is still bulletproof isn't it? Thinking more, they managed to beef up the zx750 turbo transmission from the z650 parts bin , so I suspect it was maybe more of a marketing/build cost decision. Also the competitor's GSX750 and Honda CBX750 were 5 speed too, so not really expected at the time in that market sector. the GPz750R1 in comparison more 'mutton dressed as lamb' as in the last rendition of an older z650 design. Kawasaki had the '82 62 hp GPz550 unitrack ready for 1981, but wanted to keep something back for the next model , again marketing above engineering. So they could have, and probably should have, but didn't for exactly the right reasons that seems so wrong to us.